Venezuela's President Nicolas Maduro, center, and first lady Cilia Flores, left, interact with supporters from a balcony at Miraflores presidential palace during a rally in Caracas, Venezuela, Jan. 23, 2019. Russia, China, Iran, Syria and Cuba have come down on one side. The United States, Canada, and countries in Western Europe are on the other. But Washington's adversaries are issuing warnings against U.S. intervention. Russian officials have called the move a “coup” orchestrated by the U.S. The U.S. and Russia already are at odds over Syria's civil war, and the Venezuelan crisis has the potential to add further strain. Russian-U.S. ties have sunk to post-Cold War lows over Moscow's support of separatists in Ukraine and allegations of Russian meddling in the 2016 U.S. election. 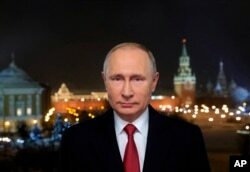 In this photo released by Kremlin Press service via Sputnik agency, Russian President Vladimir Putin speaks during a recording of his annual televised New Year's message in the Kremlin in Moscow, Jan. 31, 2018. Venezuela's status as a major oil producer — it has the world's largest underground oil reserves, but crude production continues to crash — means its political instability has deep implications globally. Russian Prime Minister Dmitry Medvedev is seen in a group photo during the second day of the international conference on Libya in Palermo, Italy, Nov. 13, 2018. Russia's Foreign Ministry said Thursday the crisis now “has reached a dangerous point” and urged the international community to mediate between the government and the opposition. China's Foreign Ministry also sternly urged against interference by Washington in Venezuela. Beijing's allies, including Iran and Syria, followed suit. In the last decade, China has given Venezuela $65 billion in loans, cash and investment. Venezuela owes it more than $20 billion. China's only hope of being repaid appears to lie in Venezuela ramping up oil production, although low oil prices and the country's crashing economy appear to bode poorly for such an outcome. 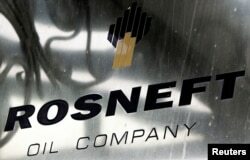 FILE - A logo of Russian state oil firm Rosneft is seen at its office in Moscow, Oct. 18, 2012. Russia is estimated to have poured in at least $17 billion in Venezuela in loans and investment since Maduro's populist predecessor, Hugo Chavez, came to power in 1999. 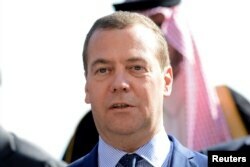 The Economic Development Ministry said Russia has invested around $4 billion in Venezuela, mostly in joint oil projects. Chavez traveled to Iran in 2006 and received the country's Islamic Republic Medal, its highest award, from hard-line President Mahmoud Ahmadinejad, who called Chavez a “brother and a trench mate.” Chavez vowed Venezuela would “stay by Iran at any time and under any condition.” Both leaders faced criticism from then-U.S. President George W. Bush and offered their own withering criticism of him. After Maduro took power upon Chavez's death in 2013, Iran has maintained its support of Venezuela. On Thursday, Iran's Foreign Ministry spokesman Bahram Ghasemi criticized the U.S. and other countries over meddling in Venezuela. “The Islamic Republic of Iran supports the government and people of Venezuela against any foreign intervention in the internal affairs of Venezuela or any other illegitimate and illegal measure such as a coup d'etat,” Ghasemi said. 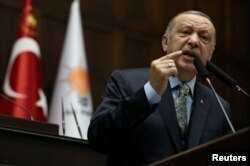 FILE - Turkish President Tayyip Erdogan addresses members of parliament from his ruling AK Party (AKP) during a meeting at the Turkish parliament in Ankara, Turkey, Jan. 15, 2019. Turkey also has cultivated close economic and political ties with Maduro. During a visit to Venezuela in December, Erdogan blamed U.S. sanctions for the country's economic hardships. Syria also came to the defense of Maduro's government. Damascus reaffirmed its “full solidarity with the leadership and people of the Venezuelan Republic in preserving the country's sovereignty and foiling the American administration's hostile plans,” the Syrian Foreign Ministry said. Cuba's Foreign Ministry said Havana “expresses its unwavering solidarity” with the Maduro government. Cuba has sent its closest ally tens of thousands of workers, from doctors to intelligence officials, and in return has received tens of thousands of barrels a day in heavily subsidized oil.